This is the American base of Team Aruba drag racing (Ven Enman's Aruba Tourism-sponsored IHRA Pro Stock) team. This facility features 16 lighted tennis courts, canopies for shading, front porch areas, a pro-shop, 3,500 feet of lighted walking trails, more than 150 parking spaces, and 12 lighted pickleball courts. The new $3.5 million racquet complex is booking USTA sanctioned tournaments year ‘round. Open daily. 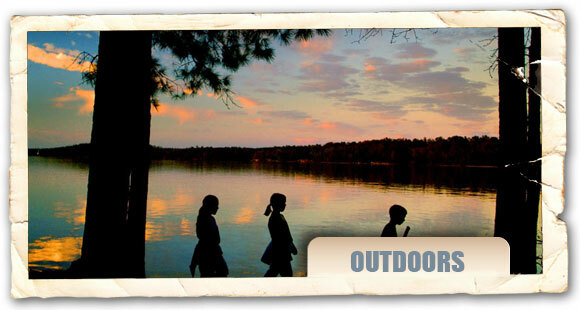 This is probably the largest and most feature-rich campground in the area with 52 full service sites and 6 tent sites. Offers 20 and 30 AMP hook-ups at all sites with a limited selection of 50 AMP hook-ups for RVs. All RV sites include running water and sewer. All tent sites include 20 AMP electricity and water. Additionally, there are 3 bathhouses all within a short walk of most campsites. They include hot and cold running showers and washing/drying machines for use by all patrons. The public access pavilion has a full service kitchen with a big screen TV that provides a full Dish Network satellite package for all guests. The fenced-in playground is available for use by all children 10 years of age and under. Offers a perfect setting for outdoor weddings, garden parties, birthday parties, family reunions or corporate get-a-ways. The 1850s historic house, peaceful gardens, large lawns, mature oak trees and old barns allow options for events large or small, simple or lavish. Set on 33 acres of rolling landscape with beautiful sunsets, it is a photographer’s paradise, and a site on the SC Ag + Art Tour. A restored 1920s cottage is available for rental for a weekend in the country. This is a family-owned and operated premier mobile service offers paddling trips to several bodies of water for exploration and enjoyment. Also features canoe, kayak and inner tube rentals for self-guided tours of local waterways. This IHRA sanctioned Division 2 “east” track is 1/8 mile 2500’ long, 60’ wide with 850’ on concrete. It is equipped with a COMPU-LINK timing system. Racing will be on Thurs, Fri, Sat, and some Sun. VIP tower suites available and other amenities. 73 campsites (41 new and improved). Water, power, sewer full hook ups, bath house, picnic area, ice available, convenience store, grill, dump station, and boat ramp. Kayak rentals available. Fishing and pets allowed. This facility offers two challenging courses for disc golf players. The Lake Course, the shorter of the two, is an 18-hole walk around the beautiful sight of Winthrop Lake. The Gold Course is one of the most challenging courses in the area. Some of the best disc golfers from around the world come each year to play this course and participate in the U.S. Disc Golf Championships, which is hosted by the university. A 25-acre multi-purpose facility that includes five lighted ball fields with concessions and restrooms, lighted walking trails, eighteen championship horseshoe courts, picnic shelters and a playground. This non-profit botanical garden is home to many plants with historical or current medicinal uses from around the world, with a special emphasis on those hailing from the Piedmont and Southern Appalachian corridor. Regular events scheduled. A SC Ag + Art Tour site. Other times by appointment only. This excellent fish habitat has three ponds with dams that range from 20 to 26 feet deep. The ponds offer over 600 feet of docks for fishing and wildlife viewing. Also, a residence lodge, fish camp, out buildings, deer stands, stable, jumping arena, horseback riding trails, gazebo, arched bridge and more. Site rentals and overnight retreat lodging. Regular specials on the rates. This is a dynamic collection of recreation amenities located at the new Riverwalk community! These amenities add approximately 250 acres of public recreation space to the City of Rock Hill’s current parks inventory. Amenities include cycling venues, athletic fields, trails, green space and a kayak/canoe launch. This Ag + Art Tour farm raises healthy all-natural pastured Berkshire pork, pastured chicken and lamb. Also grows seasonal produce. Check out the monthly farm days when artisans, crafters and vendors are onsite selling and farm tours are offered. Other times, call or text before coming just in case "farm chores" are going on.